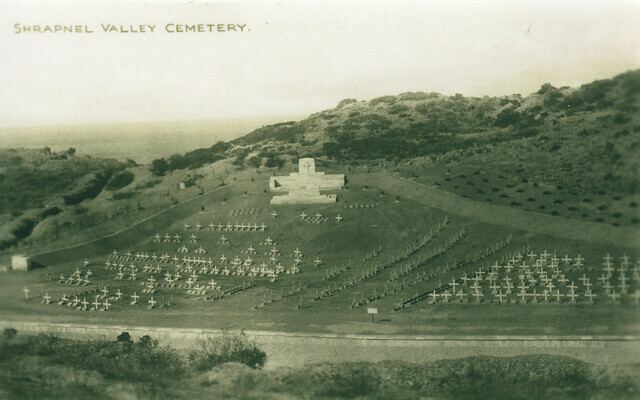 There are thirty-one cemeteries on the Gallipoli peninsula. Images of them during the post-war reconstruction are rare and printed on postcard like this one unusual; it appears to be part of a set as I have two other similar ones. It shows the transition of the cemeteries from wooden crosses to the permanent burial places they became. Shrapnel Valley was a route up to the front line in the ANZAC sector at Gallipoli and the cemetery is dominated by Australian Imperial Force graves including Major Hugh Quinn of Quinn’s Post fame. The upper part of Shrapnel Valley was called Monash Gully (after Sir John Monash, then commanding the 4th Australian Infantry Brigade). The main valley obtained its name from the heavy shelling of it by the Turks on the 26th April, 1915. It was an essential road from the beach upwards. Wells were sunk and water obtained from it in small quantities; on the South side of its lower reaches were camps and depots; and gun positions were made near the mouth of it. The cemetery was made mainly during the occupation, but partly after the Armistice by the concentration of isolated graves in the Valley. There are now nearly 700, 1914-18 war casualties commemorated in this site. Of these, over 80 are unidentified and special tablets are erected to commemorate 21 soldiers from Australia and two from the United Kingdom for whom there is evidence of burial in the cemetery. The cemetery covers an area of 2,824 square metres and the South-East side which borders the gully is enclosed by a concrete retaining wall. This entry was posted on 09/01/2012 by sommecourt. It was filed under Gallipoli, War Cemetery, WW1 . Such a waste of life. my great uncle died in Shrapnel Gully – no grave. just sad. My wife & I have visited Gallipoli many times and have our own contact at Shrapnel Valley,have you ever visited the Cemetery?I can email you images if you want. We are in Scotland and visit Turkey every year (25) years.